5 months 5 months 5 months! what?! so much has happened since my last update! 2 weeks ago we had our 4 month check up (and more shots – sad face) and we’ve found out that we’ve got a little boy. At 14lbs and 23 inches, Oliver is in the 5th percentile for his age. I was a small baby; I’m not worried! however, he is SO advanced for his age! we quit swaddling at 17 weeks and 2 days later he started rolling. both ways. we had a few rough nights when he started rolling and getting stuck on his belly or in the corner of the crib, but 2 or 3 nights in he got the hang of it and started falling back asleep on his belly. It was crazy too; the second he could roll from his back to his belly, he LOVED tummy time. he is so stinking strong – he’s even army crawling now (his poor face!). he’s been to a live show and a studio listening party and fallen asleep in both and he loves to watch dad practice. somehow it always turns into a dance party. 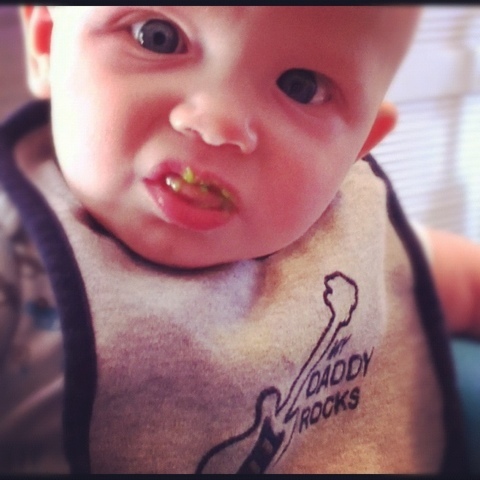 on the 19th i started introducing solids; it was sooner than i had originally wanted to but after stealing food from my plate or spoon for a week or so, i figured he was ready. it took a few days to get the hang of it but we’re now up to 2 solid feedings a day and as of today he’s eating grains, sweet potatoes & peas. We got a baby bullet as a shower gift from burt’s office and i love it! HE’S SITTING!!! seriously, he is growing so fast! a week an a half ago we started practicing on our bed and almost immediately he got it. we’ve worked up to sitting by himself for almost a full minute now even while playing with toys! still no teeth yet but i know we’re close. his eyes are still blue so i’m hoping that means they’re not changing and his hair is growing back a light strawberry blonde. We’ve now hit the 1000 mark in diapers and he’s consumed over 25 gallons of milk. he’s completed his first plane trip; this past weekend we flew to cleveland to visit my dad & step mom’s side of the family and celebrate my brother’s high school graduation. i’ll save that for a separate post but he did amazing – even with the delays on the way home. he loves his puppy & kitties; they’re all so great with him. i love that he’s showing an interest for animals at such an early stage.